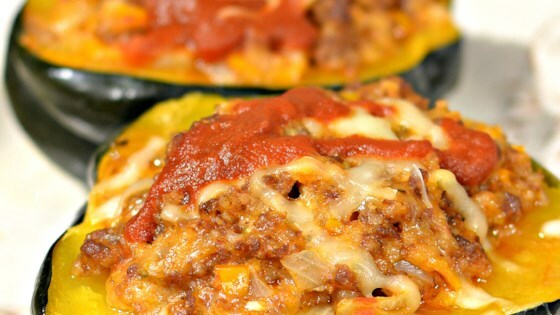 "This quick and easy acorn squash stuffed with sausage is an irresistible fall dish, and it's all done in an Instant Pot®." Turn on a multi-functional pressure cooker (such as Instant Pot(R)), add olive oil, and select Saute function. Add sausage, onion, and bell pepper. Cook until sausage is browned and crumbly, 5 to 7 minutes. Add 1/4 cup marinara sauce, 1/4 cup mozzarella cheese, bread crumbs, garlic, oregano, and black pepper. Stir until well combined. Transfer mixture to a bowl; drain and discard any excess grease. Stuff each squash half with sausage mixture. Place trivet inside the pressure cooker pot and add water. Place stuffed squash halves on the trivet. Close and lock the lid; be sure vent is sealed. Select high pressure according to manufacturer's instructions; set timer for 4 minutes. Allow 10 to 15 minutes for pressure to build. Release pressure using the natural-release method for 7 minutes. Release remaining pressure carefully using the quick-release method according to manufacturer's instructions, about 5 minutes. Unlock and remove the lid. Carefully transfer squash halves to a serving plate and top with remaining marinara sauce and mozzarella cheese. Roasted acorn squash stuffed with spicy sausage and leftover rice.